49 of us gathered for a New Garden Paleo tour, beginning at the beautiful Imperial Koi. Wednesday nights offers $5 Martinis, so I sipped a Cosmo and only answered to the name of "Carrie." Just kidding. The menu was printed on a delicate piece of paper, and my mouth began to water as I read over our courses. The Asian Pear and Beet Salad was served with a Lemongrass Vinaigrette, saltier than I imagined, and was good, but would have been excellent with some Gorgonzola cheese! (As suspected, the standard dinner menu offers this salad with Feta! Not tonight though! I'll have to keep dreaming...) We were given two pieces of sushi - the first, riceless: a Salmon Mango Wrap with sliced Cukes and Mango, surrounded by Salmon Sashimi, topped with Avocado and Flying Fish Tobiko. The Citrus Spice Roll hit on the umami notes of your palate, but did in fact include rice! 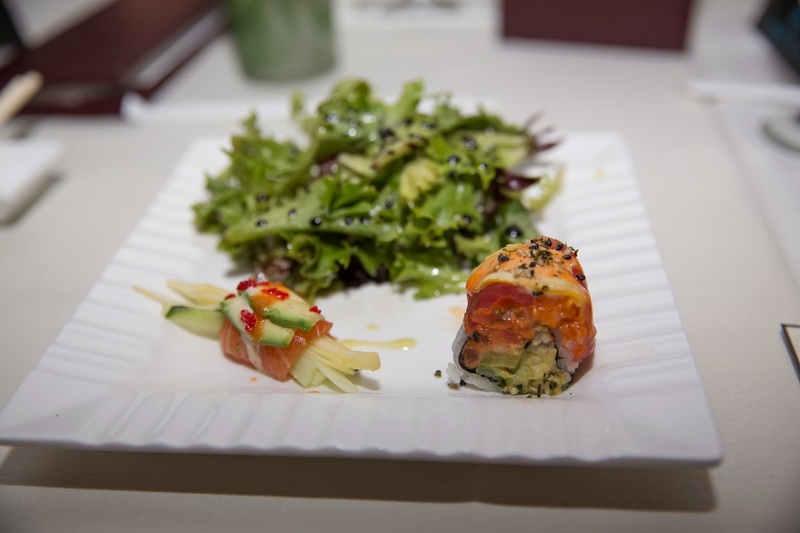 Spicy Tuna, Oshinko (Japanese Pickle), Cukes and Avocado are wrapped in Nori paper, and topped with Spicy Salmon, Orange Segments and Tuna Sashimi. Both were super fresh and savory. We followed this with spicy Basil Chicken with Bell Peppers, Onions and Asparagus in a Thai Basil, Chili Oil and Ginger sauce. We essentially dined and dashed, so props to the kitchen for being so timely! Trying to improve my photog skills! We braved the frigid weather (20 degrees is cold, people!! ), and made our way to Reel Seafood Grill, operated by the owner of former Greensboro staple Bert's Seafood Grille. A warm bowl of Oyster Stew (more like a soup) was the first thing we sampled. Unfortunately, I only got one oyster, but I needed to save room for what was to follow. 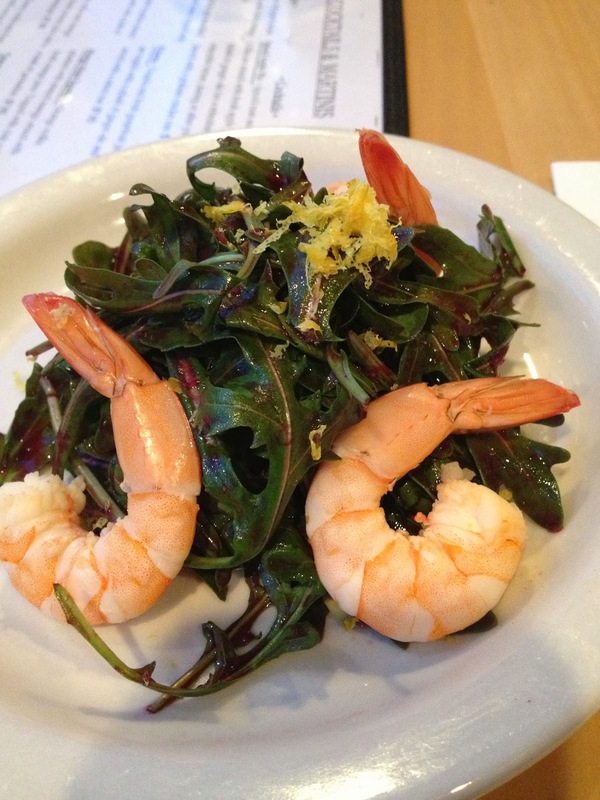 Lemon Poached Shrimp on Arugula with Honey Blueberry Dressing was so refreshing - a perfect summer cookout dish! The third course topped it though, and was my favorite of the entire night. Smoked Rainbow Trout had wonderful smokey flavor, reminiscent of Bacon (!) 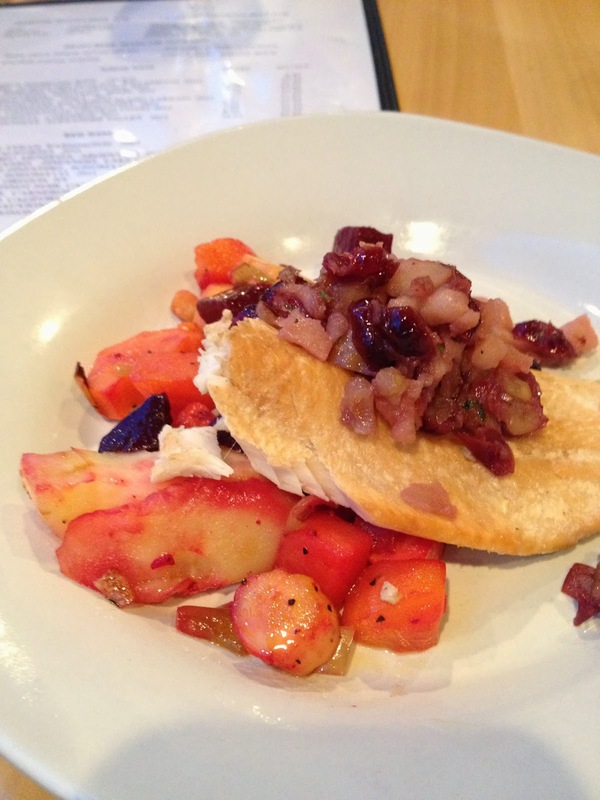 and was served with Roasted Root Veggies, and a tart Apple, Cranberry, Walnut topping. The dish had terrific balance. Six small plates later, I was beginning to feel pretty full, and I hadn't even missed grains or dairy! Good thing there was some trekking involved, because we had one more stop to go! I was under the impression that this would be a dessert trio, or even one dessert, which would have been PLENTY. Instead, Gia greeted us with three more courses! My colleagues and I decided to take advantage of the half-off bottles of wine special. When your colleagues include food & wine expert and Greensboro celeb John Batchelor, you let him do the picking. He suggested a 2012 Sonoma County Ferrari-Carano Fume Blanc, perfectly crisp and subtly sweet to finish off the evening. 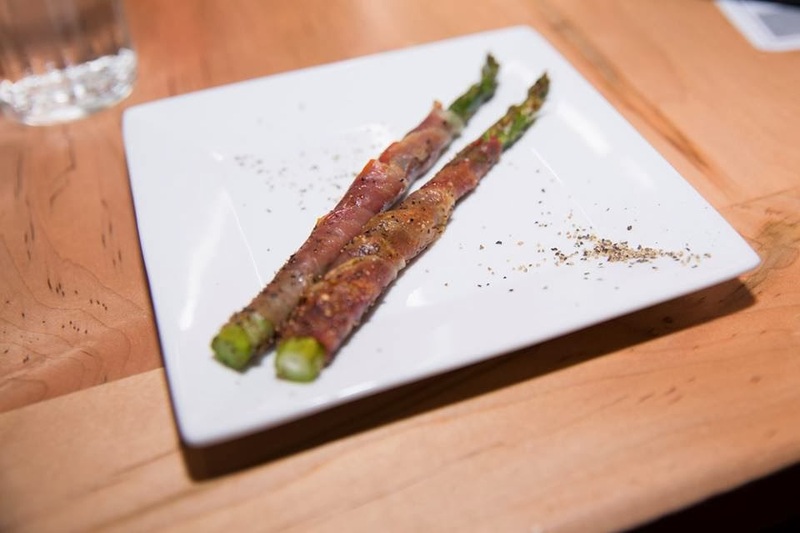 Prosciutto-Wrapped Asparagus tastes so much more indulgent than it actually is. The Asparagus was so tender and the flavor burst in my mouth! The second course was a Chicken Kabob, a juicy piece of white meat hugging a caramelized Cipollini Onion, giving a jam-like consistency. Sauteed, garlicky spinach served as a bed for the Kabob. Finally, the dessert course. I was stuffed, but so ready for this. We were served a spin on Mexican Flan, and its consistency was flan-ish, but the fact that it was made with Almond Milk left the dish just a little lacking. 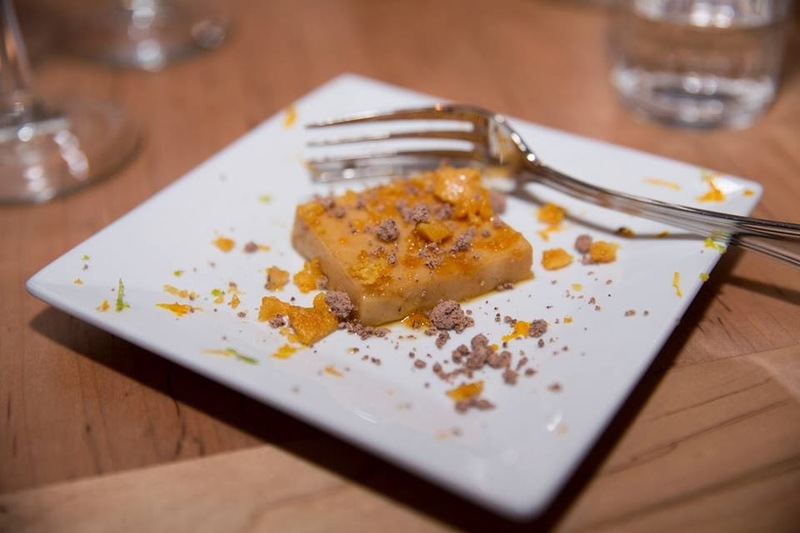 Citrus Honey Brittle and Powderized Chocolate were a fun peek into molecular gastronomy, a growing trend. I always love ending the night on a sweet note. The event filled up weeks in advance, and the waiting list was added to right up until the kick-off! Don't worry - there are future Dishcrawl Paleos in the works. Still hungry for more? Join me at Battledish, Saturday, February 8! Tickets are on sale now for what's sure to be an awesome afternoon. Get involved, people! Dishcrawl is a seriously cool thing.